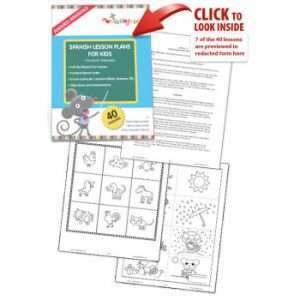 Developed by creative and experienced educators, this award-winning curriculum of 40 lessons engages children in fun, interactive, age-appropriate activities, such as creating puppets, following recipes, conducting experiments, and playing board games. In addition to Spanish, the curriculum includes cross-curricular lessons in math, science, and physical education. Beginning with Lesson 1 Who am I? (¿Quién soy? ), the lessons flow in a logical progression of thematic units (Colors, Numbers, Shapes, Places, Around the House, Clothing, Seasons, Parts of the Body, Positional Words, Food, Family, Animals, and Descriptive Words), culminating in a fiesta. Lessons identify clear goals and learning objectives as well as extension activities that are designed to enhance children’s appreciation of Spanish culture. The lessons emphasize the development of proficiency in speaking and listening, with play-based assessments included to allow educators to evaluate student progress. 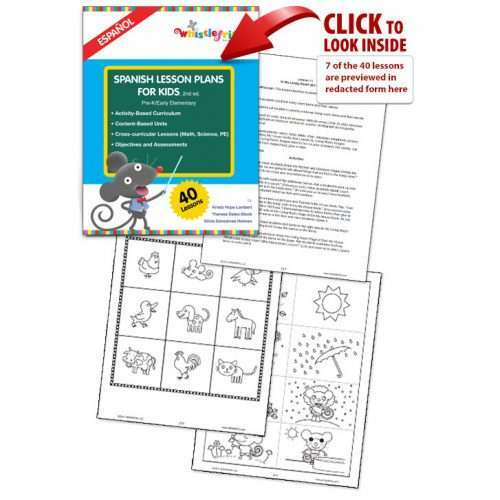 Spanish Lesson Plans for Kids is an adventure in learning for teachers and students!